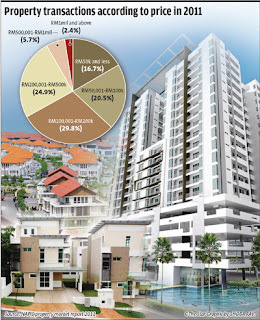 KUALA LUMPUR: The Government is considering raising the minimum floor prices of houses foreigners are allowed to buy to RM1mil from the current RM500,000 in an effort to control the rise in property prices, sources said. They said such a decision was “in the pipeline” and the implementation would be made by the economic planning unit (EPU) under the Prime Minister's Department currently headed by Minister Tan Sri Nor Mohamed Yakcop. “From what I understand, these revised guidelines have been discussed at the ministerial level and should this be enforced, it will mean that foreigners will only be allowed to buy properties priced above RM1mil. For now, the base price is set at RM500,000 for foreigners. This base price is a bit low looking at present circumstances,” a government source who requested anonymity said. “The current trend in the property market indicates that prices are still continuing to climb despite measures by Bank Negara to curb property prices from spiralling out of control. We need to act before it goes further out of hand,” the Putrajaya source added. Another source said the revised guidelines would also consider a slightly lower base price threshold of RM800,000 for residential properties in selected economic corridors such as Johor's Iskandar Malaysia to ensure the development and success of these corridor hotspots. “This base price will also be subject to reviews by the Government from time to time depending on the inflationary situation of the economy and to keep overall inflation in check,” the source said. Deputy Finance Minister Datuk Donald Lim had recently told the press that the Government would take “strict measures” to avoid a US subprime mortgage financial crisis after average house prices jumped almost 7% in the fourth quarter of last year despite measures announced by Bank Negara to rein in property prices. “The Government is worried about property prices causing a bubble and we don't want banks to overlend to the property sector,” Lim said. Industry sources surveyed by StarBiz said foreigners that tend to buy properties in Malaysia were those from South Korea, Japan, China and Singapore. “This move will give an advantage to locals, especially those in the middle-income category as locals will not need to compete with foreigners. I am not surprised by this move, but our agency has so far seen mostly people from China and Singapore buying properties above RM1mil anyway,” a KL-based licensed real estate negotiator who did not want to be named said. “However, we may see fewer transactions from the Koreans and Japanese. Westerners such as those from the United States and Europe won't usually buy. They prefer to rent instead,” the real estate negotiator added. Meanwhile, the implementation of the higher floor price is expected to have a minimal impact on the property market in Malaysia as official statistics show that only 2.4% (worth RM1.45bil) of transactions conducted in the residential sector last year were worth RM1mil and more. The Finance Ministry's Valuation and Property Services Department Property Market Report 2011 released last week showed there were 269,789 residential property transactions worth RM61.83bil transacted last year, the highest recorded in the last five years. “Both volume and value recorded double-digit growth of 18.9% and 22.1% respectively. The All House Price Index surged to 156.9 points in the fourth quarter (Q4) of 2011 against 147.2 points registered in Q4 2010,” the report said. The report said that landed housing was on a “general upward trend” in Malaysia and also attributed the rise in property prices to the Sungai Buloh-Kajang My Rapid Transit project. 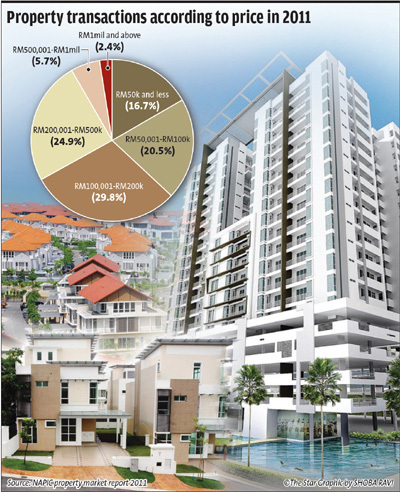 “Across the board, terraced houses in KL recorded increases of 8%-13%. Increased prices of landed houses on Penang island were apparent. The highest transacted price of two- and three-storey detached (houses) were at RM2.05mil and RM5.15mil respectively,” the report said. AMANAH Hartanah Bumiputera (AHB) is eyeing more property acquisitions and increasing its land bank, especially in the Klang Valley, to enlarge its current fund size of RM1 billion. 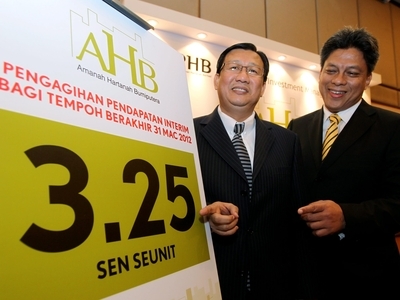 AHB is the country's first syariah-based property unit trust fund and is open only to Bumiputera investors. Pelaburan Hartanah Malaysia (PHM) chief executive officer Datuk Kamalul Arifin Othman said the fund is scouting for more properties such as offices, retail, industry as well as land banks. "We are certainly looking at expanding the size of the fund as part of efforts to foster equality in Bumiputera property ownership. We are in talks for a couple of acquisitions," Kamalul told reporters here yesterday after unveiling its first out of two dividend payouts for the year. He, however, declined to reveal details or specify the fund's target size. Kamalul said the fund manager will continue to source new assets to be injected into Amanah Hartanah Bumiputera to provide its 60,000 investors with good and consistent income stream. "We are looking to buy more completed and income-yielding assets, expand our 52.6ha land bank and venture more into property development, especially in healthcare as we believe in the future of the sector," said Kamalul. 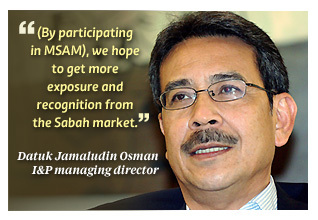 Kamalul said next year, PHM plans to include its 8ha parcel of land in Jalan Bangsar into AHB. Another property to be injected into the fund is the Lot G development at KL Sentral, which includes an office tower and shopping complex spanning 900,000 sq ft with a gross development value of RM1.4 billion. Established in May 2006, PHM is a real estate investment holding company and is a subsidiary of Yayasan Amanah Hartanah Bumiputera and Mayban Investment Management Sdn Bhd under the purview of the Ministry of Finance. Together with Mayban Investment Management Sdn Bhd, it currently manages AHB with eight properties under its wings with a value of RM1.4 billion and a recurring income of RM10.5 million per annum. Its properties include Darul Ehsan Medical Specialist Hospital in Shah Alam, Blok D Peremba Square in Saujana Resort, Menara Bumiputera Commerce in Jalan Raja Laut, CP Tower in Petaling Jaya, Wisma Consplant in Subang Jaya, Tesco Setia Alam, Menara Prisma in Putrajaya and Logistics Warehouse in Shah Alam. 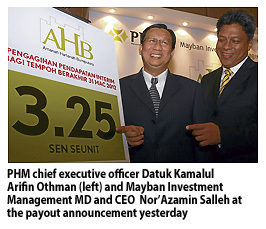 Meanwhile, Mayban Investment Management Sdn Bhd managing director and chief executive officer Nor'Azamin Salleh said AHB has declared an interim income distribution of 3.25 sen a unit, which involves a total payment of RM232 million for its 60,000 unitholders for the six-month period ended March 2012. The income distribution is payable twice a year for periods ending March 31 and September 30 each year. It is tax exempted. Since its inception in November 2010, this is the third income distribution made by AHB. The fund declared its first income distribution of 2.17 sen a unit for the four-month period ended March 31 2011 and a second income distribution of 3.25 for the six-month period ended September 30 2011. The first payout for this year will be credited into unitholders' bank accounts today. KUALA LUMPUR: UEM Land Holdings Bhd's wholly-owned subsidiary, Nusajaya Premier Sdn Bhd (NPSB), has proposed to acquire 49.49 hectares of freehold land in Johor Baru from Tanjung Bidara Ventures Sdn Bhd for RM93.2 million cash. In a filing to Bursa Malaysia yesterday, UEM Land said the proposed acquisition was conditional upon approvals being obtained from the Economic Planning Unit, Johor State Authority, Estate Land Board and any other relevant authorities. "The land is adjacent to Kota Iskandar and the company's existing prime development in Nusajaya, Puteri Harbour," UEM Land said. On rationale, it said the proposed acquisition would allow the group to realise its original development vision for Puteri Harbour, where high density urban waterfront precincts at the heart of public and private marinas are balanced with landed and high-rise residential precincts on both sides. Barring any unforeseen circumstances, UEM Land expects the proposed acquisition to be completed within seven months.